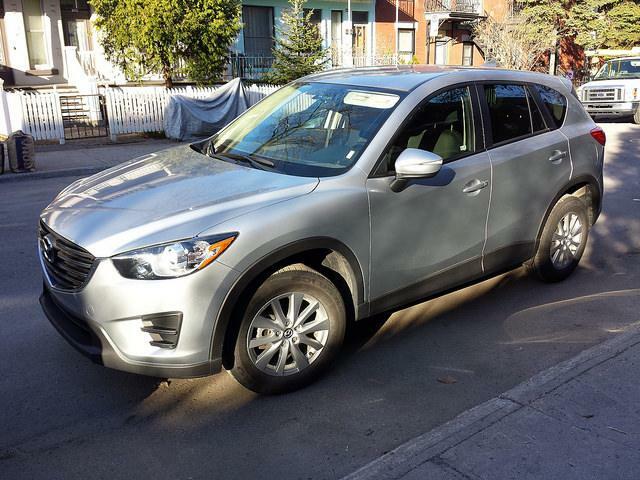 The 2016 Mazda CX-5 offers a stylish, tech-rich package that has earned the admiration of leading auto critics. Families will appreciate its class-leading fuel economy and modern technology. When you climb inside, you’ll quickly see why the CX-5 earned the coveted A rating from auto critic Edmunds. The cabin is trimmed with more soft touches than others in its class. High quality design elements and better seats add to this crossover’s ability to please owners. Amenities include front power chairs with seat heaters. The CX-5 has one of the largest backseat passenger volumes in its class. Back row riders also have the benefit of their own rear heat vents and a fold-down centre armrest. Utility is also emphasized. There are a large number of storage cubbies of generous sizes. The cargo hold, which has its own light and power outlet, is bigger than many rivals. Measuring 966 litres, it can grow to 1,835 litres with the split-fold seats. Mazda is offering a power-fold button that creates a flat extended floor. Technology starts with keyless ignition and the latest dash tech. A 7-inch colour touchscreen utilizes Mazda Connect to deliver integrated audio features. HD radio and SMS text messaging are tech standards. The HMI controller puts audio and navigation functions in easy reach. You push, tilt or turn the dial to get a fast, accurate response to your commands. The high-tech atmosphere continues with a long list of available crash avoidance features. A blind-spot monitor, lane departure warning, and rear cross traffic alert help you avoid side swipes. A forward obstruction warning keeps the driver alert to dangers. Using an infra-red laser sensor, exclusive Smart City Brake Support can detect stopping cars as far away as six metres. Automatic braking can save the crossover from having a fender bender in stop-and-go traffic. Even the lights play a bigger role in safety. Adaptive headlights can level the beam, and the high beam features can turn the intensity up or down to match conditions. Special wipers can sense the rain. A wide-angle camera watches the rear view. Car and Driver ranks the CX-5 as the number one small crossover, beating a big field of rivals. The critic really likes the vehicle's dynamic handling. Skyactiv-Drive technology ensures a responsive engine. Handling is enhanced by the crossover’s lightweight body and dynamically-tuned suspension. Fuel economy is tops in its class. The GT is rated for 7.9L/100 km on the highway. I-Activ all-wheel drive keeps the crossover moving forward in all kinds of weather conditions. Mazda offers an advanced radar cruise control system that can regulate speed. Hill launch assist protects the brakes and the gears when starting upward on an incline. It's one of the few in its class to offer a stick shift, a favorite of driving enthusiasts. The CX-5 also is one of the few to have an electrical parking brake.